I love fresh flowers at home! They make a room instantly brighter and prettier. But it's not always economical to buy pretty arrangement at a florists. So instead I've worked on a way to elevate a simple grocery store bouquet to look way more expensive than it actually is. So next time you're at the grocery store, grab the $12.99 bunch and try it out! Choose a monochromatic bunch or one with a maximum of two colors. I look for bunches with lots of green and one other color that works for the season. Sometimes I just buy greens, or even a bunch of babies breath works great! This bunch is mostly green with pops of orange. There is a white hydrangea in there but it's a pretty flower and white is always ok to mix with green and another color. I look for small branches with delicate twigs. If the branch is too thick it will look out of scale with the rest of the flowers. In winter I go with bare branches, but in spring, fall and summer I keep the leaves on for extra loveliness. For this arrangement I picked a simple white wood box for my vase. I wanted something to contrast the prettiness of the flowers and give them a touch of contemporary flair. I have a bunch of unusual vases I've collected over the years from thrift stores. Also, look at your pots and pans, and even bottles or food containers for inspiration. It's different for every bunch, but generally I separate out the different types and lay them out from most to least. This gives me a visual map of what I have. I start arranging with the type I have most of because they will make up the bulk of the arrangement. Single flowers I save for last as they become the accents and focal points. Above is a graphic that shows each step in the process of this arrangement. I love how this trick makes for a more contemporary arrangement. I always bring just one flower of the bright color into the more neutral side for a bit of balance, but generally I keep colors separate. Keeping everything low and allowing one or two flowers to rise above creates a focal point and clear hierarchy. 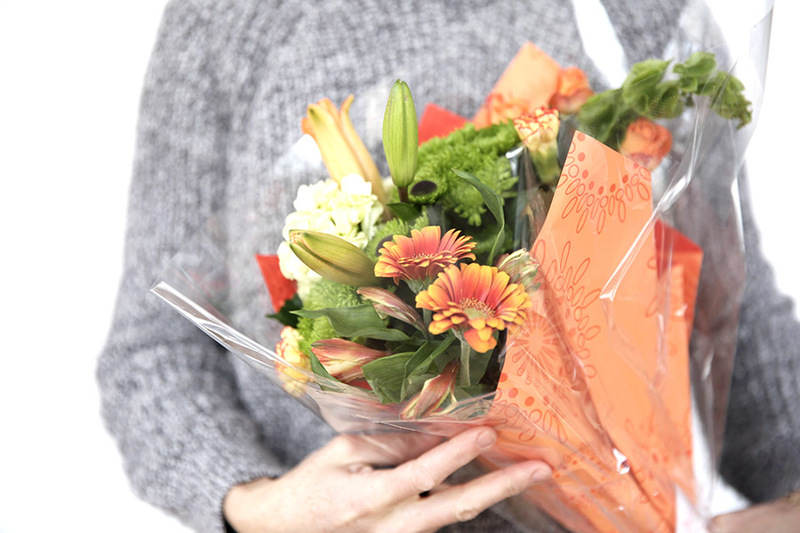 With grocery store bunches, all the flowers aren't always pretty. This way the one pretty one that is included becomes the star. This final touch makes everything more grand! The branches add height and drama but because they are thin don't overpower the arrangement. I tend to keep them off to the sides so that the focal point of the arrangement is still the two flowers in the center that rise above the others. Von's 2nd Birthday in Portugal!